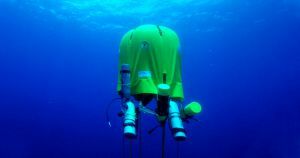 The shelter gives divers a place to decompress and maybe even conduct research. A new underwater tent can give divers a brief respite — the floating pocket of air could either let divers take a breather or help them prevent potentially dangerous cases of decompression sickness. The Ocean Space Habitat, recently patented by New York University researcher Winslow Burleson and National Geographic explorer Michael Lombardi, makes it possible for divers to stay underwater longer than ever before, and may help influence future off-world settlements. The portable tent can be brought deep beneath the surface and anchored wherever it’s needed. Fans powered by rechargeable batteries continuously scrub carbon dioxide from the air, giving divers access to about six hours of breathable air, a number the developers are working to improve. The researchers tested out their system last October, and now they’re gearing up for an overnight stay underwater, an NYU spokesperson told Futurism. As scuba divers ascend after a dive, they need to periodically pause so that their blood pressure can adjust to the decreasing pressure around them. Normally that means staying suspended in the water. But with the inflatable tent in place, they’ll be able to remove their mask to breath naturally, and otherwise have a more comfortable experience. In the immediate future, the team is working on developing new sizes and shapes, which they say won’t take any new technological developments — it’s more a matter of manufacturing a new design that could have a closed floor or room for a bed or scientific instruments. From there, everything is up to the specific needs of the diver. “The number of times that a diver could re-deploy on a single dive, would then depend on the size of their habitat and the amount of gas they are willing to bring with them,” Burleson told Futurism. Automatically-inflating, portable habitats may find use above the sea as well — the newly-awarded patent describes how the underlying technology could be used in outer space or on extraterrestrial settlements, something that Lombardi told Futurism is becoming a very real field of research.